The method that is most commonly used for shaping is to heat the steel to around 1,200°C in a reheat furnace and roll the steel, squeezing it between sets of cylinders or rolls. Rolls are arranged in pairs and housed in a ‘stand’. 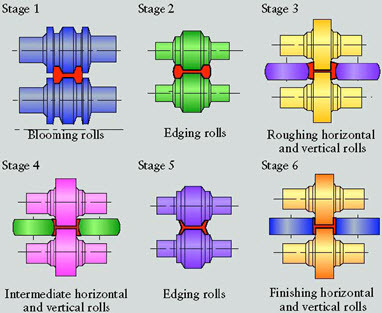 To change the shape of a material as strong as steel the rolls must exert forces measured in thousands of tones, and must also draw the steel continuously through the rolls while reducing the thickness. 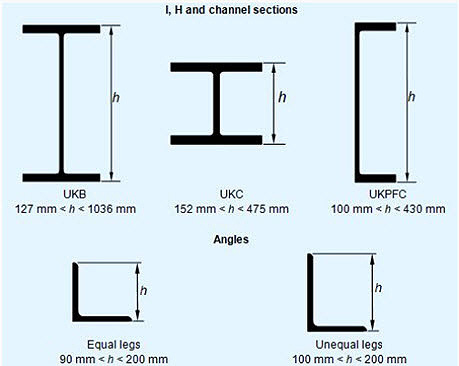 Two main classes of product are produced – flat products, sheets or strips of uniform thickness, and long products – lengths of a particular cross section, ranging from rectangular bars to double flange H sections. For flat products, two horizontal rolls are set one above the other in an open housing. This entry was posted in Manufacture. Bookmark the permalink.